Whiskers n’ Tails, LLC is an award winning professional pet sitting service caring for pets in the Bexley, Berwick and Eastmoor neighborhoods of Columbus, Ohio since 1998. We provide your pets with the care and individualized attention they need right in your own home. We follow your pet’s regular feeding, exercise, medication and play routines and take care of their special needs. But most of all we provide your pets with lots of TLC and individualized attention. Your pets have the pleasure of being in the comfort of their own home and enjoying their regular day to day activities during your absence. We pamper them with the individualized care and attention they deserve as important members of your family. We offer both Vacation Care Pet Sitting and Dog Walking Visits customized to your pet’s specific needs. We have over 19 years experience caring for dogs, cats, birds, rabbits, fish (salt and fresh water), hamsters, turtles, ferrets, chinchillas and more! Since 1998 Whiskers n’ Tails has won numerous consumer service awards. 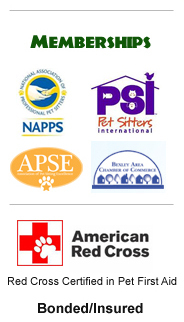 We are members of Pet Sitters International (PSI), National Association of Professional Pet Sitters (NAPPS), Association of Pet Sitting Excellence, and the Bexley Chamber of Commerce. We are bonded and insured for our customer's protection. We have a Registered Vet Technician on staff and are Red Cross Certified in Pet First Aid.